Have you ever had difficulty keeping track of all of your various tasks, projects, and collaborations? Many effective scientists I know use project management software to keep track of projects and deadlines. Popular choices are often based on David Allen’s Getting Things Done philosophy such as omnifocus and remember the milk. I have personally used omnifocus for many years with mixed success. I enjoyed that my tasks were synced across my computers and devices, but never felt like I was using it beyond a virtual “sticky pad”. Plus I always found it a bit tedious to enter all of the information associated with tasks. However, I routinely rely on many cloud based collaborative tools such as dropbox to share files with collaborators and across computers, google apps for collaborative scheduling, google hangouts for video conferencing, and hackpad, for collaborative note taking and writing. I have recently discovered cloud based collaborative project management software, and anticipate it will dramatically improve my efficiency in constant multi-tasking across dozens of collaborative projects. These software packages have become popular in tech startups, but have been relatively slow to infiltrate the scientific community, which I suspect is because our needs are a bit different. Here are a few examples. Scientists work in teams, but are mostly interested in their individual careers/projects. This is why dropbox and google apps work well. Each scientist has their own account and can work with other people, but in the end they are in control of their data and interface. Collaborations occur within and between laboratories and personnel are in a constant state of flux (i.e., primarily undergraduate, graduate, postdoc trainees). Many cloud based project management softwares are designed to be run in a stable business setting and do not work well with the ever changing laboratory landscape. Scientists need an interface for planning, tracking progress and discussing. These needs are obviously shared with many other disciplines, but scientists are generally accustomed to technology such as laboratory notebooks, which track progress of data collection, analyses, results, brainstorms, and literature searches. Scientists are not as well financed as their industry counterparts and have limited pockets of money from startup and grants to pay for software. Scientists are accustomed to academic pricing models and freeware, and are not used to the software as a service (SAAS) model, particularly when revenue sources from grants are not constant. Scientists are busy and won’t use things that are too complicated, take a lot of effort, or are unintuitive. This is one of the reasons why I think Apple products have such deep penetration into the academic community. Many scientists have little patience for the instability and insecurity of windows, or the complexity of linux operating systems. Scientists are fairly naive when it comes to management. We are trained through an apprenticeship model, and are generally unaccustomed to managing a lot of personnel and projects. In addition, we have limited resources and do not typically hire management other than lab managers. Thus, we have less training and resources to manage teams compared to other industries. Scientists like stability. Nobody wants to spend their precious time or money in learning technology that becomes quickly obsolete or discontinued (anyone remember google wave? or apple xserves?). Trello: A free online collaborative tool started by Joel Spolsky (one of the founders of stackoverflow) and based on the kanban philosophy. The general idea is that there are organizations with multiple people, boards for specific projects, lists within a board, and cards within lists that can be discussed and tasked to specific individuals. Each board can have different permissions and every user has unlimited boards. 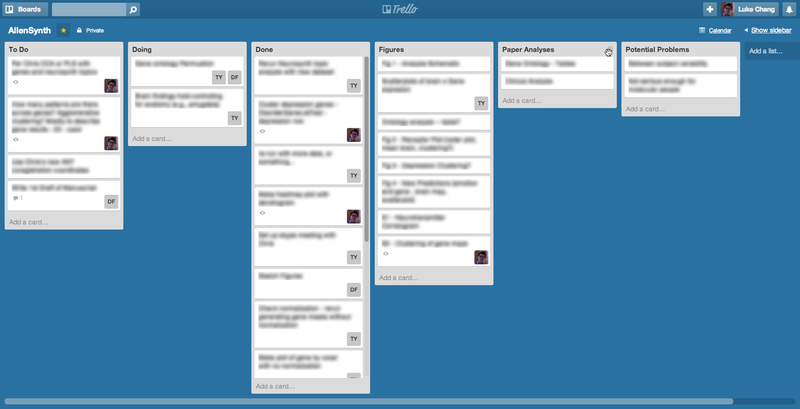 Kanban encourages cards to move across different stages of production represented as lists. This software is very simple and visually intuitive and I think works well for many different tasks such as brainstorming and collaborating on specific projects. This software is well suited to be adopted by scientists because it is free and based on interacting individuals rather than a central system for a particular organization. I think it nicely complements other cloud based apps such as google calendar, dropbox, and hackpad. Web interface, tablet, and mobile apps are intuitive, fast, and well implemented. Works well for individual research projects within a lab and across labs. Relatively easily to invite outside collaborators to specific boards. Works well as an individual project manager board. Has an open API, which adds to it’s flexible nature. 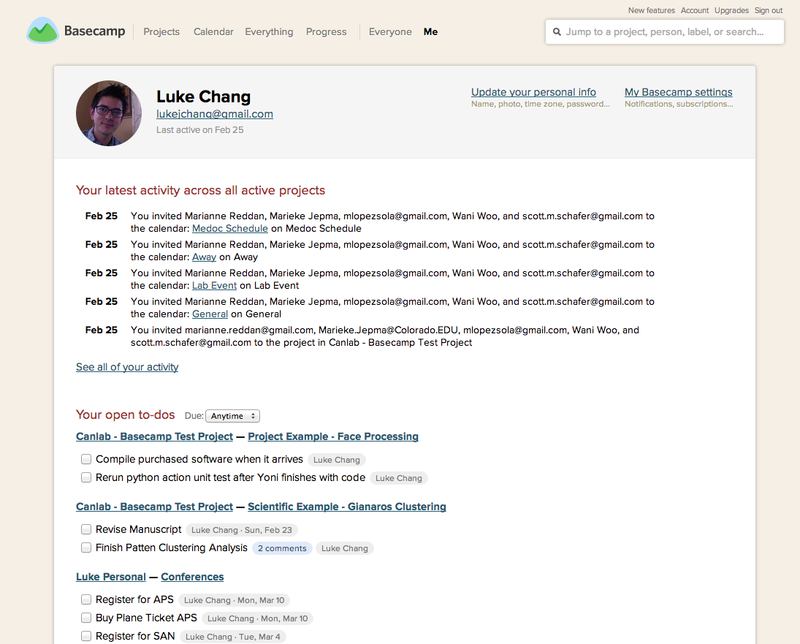 No real dashboard feature which allows you to see upcoming tasks and updates across boards. Discussions are limited to specific cards. There is no general discussion board. Calendar app is only for projects associated with a specific board. No integrated shared calendar (can link calendar feeds to google calendar though). Basecamp: One of the oldest and most popular cloud based collaborative projective management softwares and resulted in the development of Ruby on Rails. This software has projects, which can have tasks, discussions, files, and text documents. Overall, I think this is a great software for many of the important aspects of lab based collaborations. It does an excellent job of facilitating discussions and centralizing scheduling. However, it might be difficult to get all members of a large lab to participate as it is expensive, has a limited number of projects, and stays with the organization not the user. Very nice permissions. People can be clustered into groups and everything can different permissions depending on who should be involved. Can discuss anything (e.g., tasks, files, etc.). Discussions do not have to be tied to a specific task. Nice calendar integration. Can have separate calendars for specific projects, lab events, personnel availability, resource availability, etc. Really nice email integration and there are lots of third party integrations. Can pay for individual boards at $15 a month per board if you leave the lab. Limited projects. This was a very limiting factor in our lab where we needed at least 100 boards just for our ongoing research projects. Not very convenient to take with you if you leave a lab that is highly integrated with basecamp. Anyone else had positive or negative experiences with a particular software in the context of a scientific collaboration? This entry was posted in Tools of the Trade by lukejchang. Bookmark the permalink.